UNION, S.C. (Sept.17, 2018): Team Aruba debuted their new 2018 Pro Stock Mustang with much fanfare. 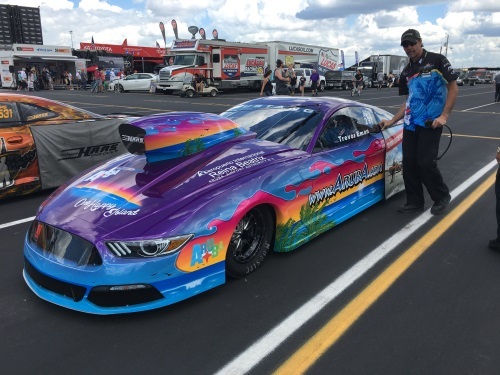 The highly anticipated Aruba.com Mustang made its inaugural passes at the NHRA U.S. Nationals, drag racing’s biggest event of the year. 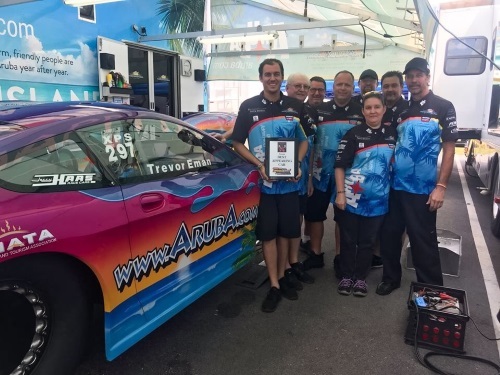 The Eman family and Team Aruba were included as one of the Mountain Motor Pro Stock (MMPS) teams selected to make exhibition runs at the U.S. Nationals, a test run for possibly altering the course of Pro Stock. The Big Go™ – as the event is known – carries the most emotion, prestige and history for drivers and fans alike, drawing the highest attendance, according to NHRA.com. Team Aruba made it to the semi-finals at the Drag Wars, an impressive finish for their first event out with a new car. Drag racing is a beloved international sport, and racers often travel from around the world to compete in series within the U.S. Team Aruba has represented The One Happy Island well, racing against the best drag teams in the world. “Team Aruba has been involved in Mountain Motor Pro Stock for the last fifteen years,” elaborated Ven. “We are grateful to PDRA for keeping the category alive and healthy. We were excited to witness our sister island Curacao becoming very successful with their own PDRA Mountain Motor Pro Stock team. This not only gives Team Aruba competition on the track, but also gives a greater impact in promoting our islands. Curacao instituting their own MMPS team comes as a high compliment to Team Aruba and the work the Eman family has put in to make their marketing model a huge success.